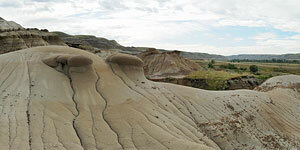 August 31 to September 2, 2010: These images were taken in the area around Drumheller. 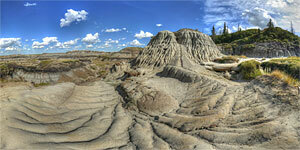 Welcome to the Alberta Badlands virtual tour of 10 panoramas. 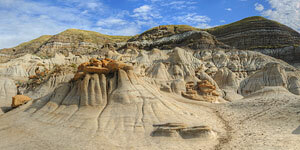 Between 100 and 70 million years ago, this area of Alberta lay along the shoreline of a vast subtropical sea. 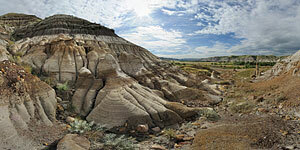 Sediment washed in from the rising Rocky Mountains. Vegetation was lush and dinosaurs flourished. 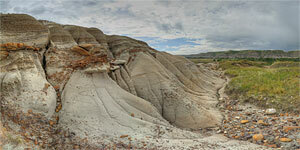 Two million years ago, the area lay under Ice Age glaciers. As the ice sheet retreated, immense ice dams held back the meltwater. 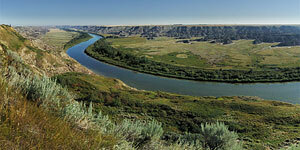 Torrents of floodwaters from collapsed ice dams scoured out these canyons. The erosion continues today. 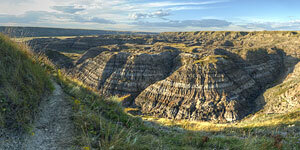 Complete fossilized dinosaur skeletons from 75 million years ago are found here in the sediment layers. 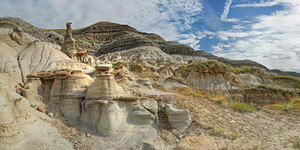 Many are on display at the excellent Royal Tyrrell Museum at Drumheller. Show a Google Map of this area. 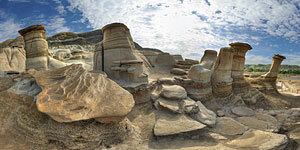 These images are previews of the scenes in the panorama tour. Links to the tour are at the top of this page.